I want to receive updates about DiEM25's campaigns. Tell people that you signed. Julian Assange, through Wikileaks, has done the world a great service in documenting American war crimes, its spying on allies and other dirty secrets of the world's most powerful regimes, organisations and corporations. This has not endeared him to the American deep state. Both Obama, Clinton and Trump have declared that arresting Julian Assange should be a priority. We have recently received confirmation  that he has been charged in secret so as to have him extradited to the USA as soon as he can be arrested. Assange's persecution, the persecution of a publisher for publishing information  that was truthful and clearly in the interest of the public - and which has been republished in major newspapers around the world - is a danger to freedom of the press everywhere, especially as the USA is asserting a right to arrest and try a non-American who neither is nor was then on American soil. The sentence is already clear: if not the death penalty then life in a supermax prison and ill treatment like Chelsea Manning. The very extradition of Julian Assange to the United States would at the same time mean the final death of freedom of the press in the West. The courageous nation of Ecuador has offered Assange political asylum within its London embassy for several years until now. However, under pressure by the USA, the new government has made it clear that they want to drive Assange out of the embassy and into the arms of the waiting police as soon as possible. They have already curtailed his internet and his visitors and turned the heating off, leaving him freezing in a desolate state for the past few months and leading to the rapid decline of his health, breaching UK obligations under the European Convention of Human Rights. 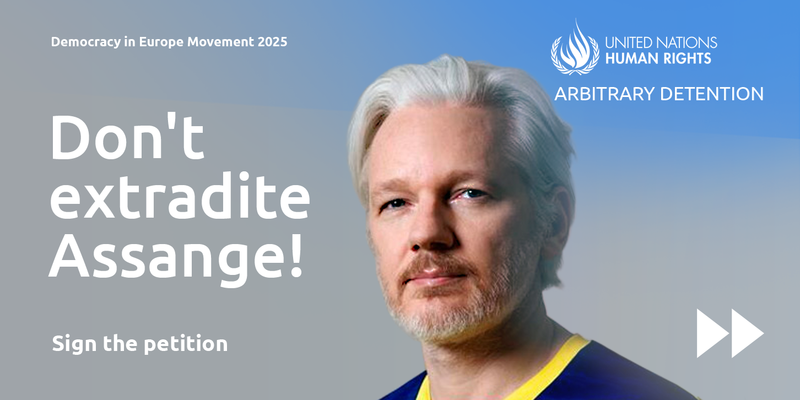 Therefore, our demand both to the government of Ecuador and the government of the UK is: don't extradite Assange to the US! Guarantee his human rights, make his stay at the embassy as bearable as possible and enable him to leave the embassy towards a secure country as soon as there are guarantees not to arrest and extradite him. Furthermore, we, as EU voters, encourage European nations to take proactive steps to protect a journalist in danger. The world is still watching.